It's still just a fitness tracker, for better or worse. When Fitbit introduced its Blaze smartwatch back at CES, many people hyped it up as an Apple Watch competitor. It's $150 cheaper, but still features a color touchscreen, notifications, a host of fitness-tracking features and impressive five-day battery life. It's also the most stylish Fitbit yet, with interchangeable watch bands that include leather and metal options. But in the week I spent testing the Blaze, I realized it's not a smartwatch in the conventional sense of the word. The Blaze is a fitness-first device that does most of the same things as Fitbit's Surge fitness band, just in a more stylish package. It looks and acts like a smartwatch, but if you expect it to have as many features as the Apple Watch or most Android Wear devices, you'll be disappointed. But does the Blaze at least bring enough to the table to succeed on its own merits? The Blaze continues Fitbit's tradition of making quality fitness trackers, but the device is ultimately let down by an uninspired design and a cheap-feeling design. Those deficiencies in style and materials make for a wearable you won't actually want to wear all day, which makes it a tough sell. How would you rate the Blaze? The Blaze is made up of two parts. 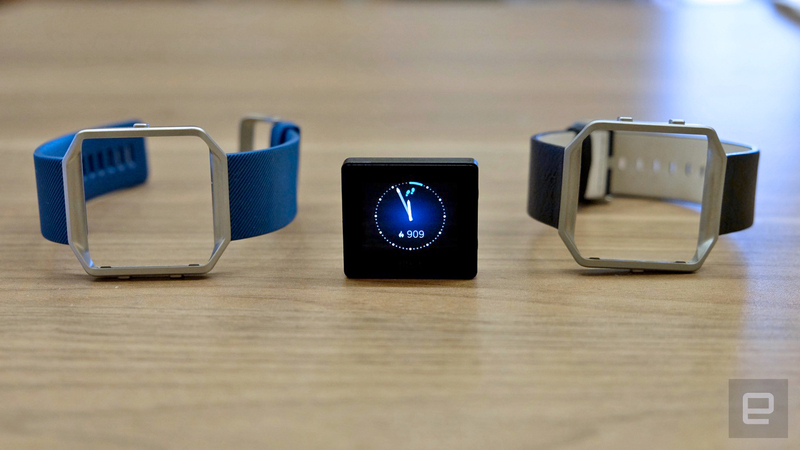 The first is a band connected to a stainless steel frame. 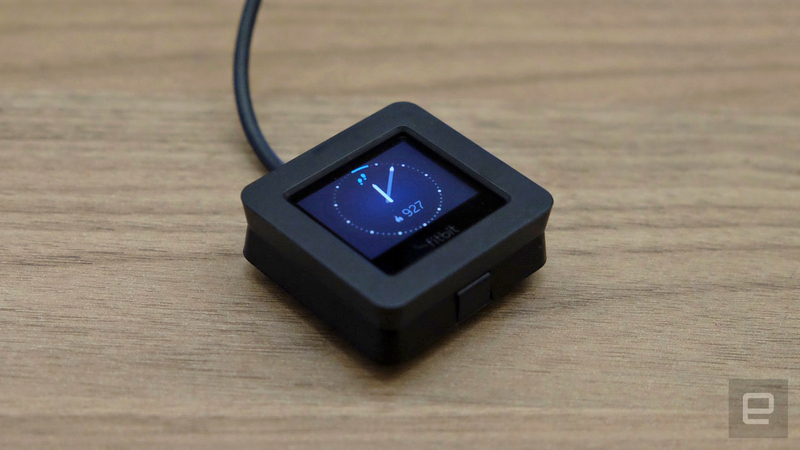 All the guts of the Blaze itself are contained in a small, standalone black rectangle that features a color touchscreen on the front, heart-rate monitors on the back and three buttons on the sides. Just snap the little tracker into the frame, and then you're good to go. The $200 base model comes with an elastomer sport strap, available in black, blue or plum. 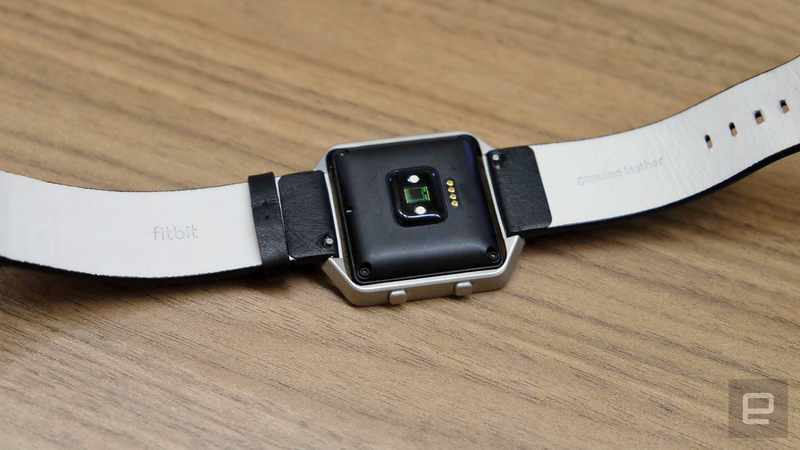 If you want to use a different band, you don't swap the band itself; you just pop the tracker out and insert it into a new frame-and-band combo. I tested the black leather strap, which sells separately for $99 and comes with another steel frame. While it's simple enough to remove the bands, Fitbit clearly thinks that popping out the tracker and dropping it into a new frame makes for a better experience. 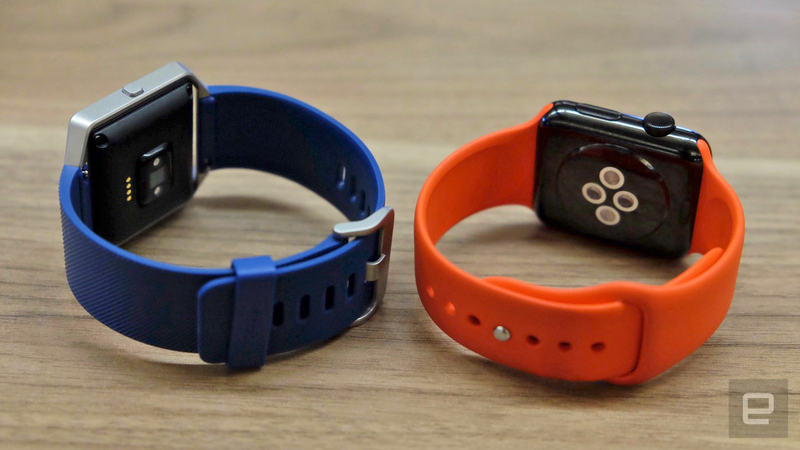 Even if you don't own multiple bands, you'll be popping the tracker in and out of its frame to charge it. The tracker drops into a weird little plastic charging frame for power; you can't rejuice it without removing it from the strap. It's odd and rather awkward, but fortunately you won't need to charge it very often. 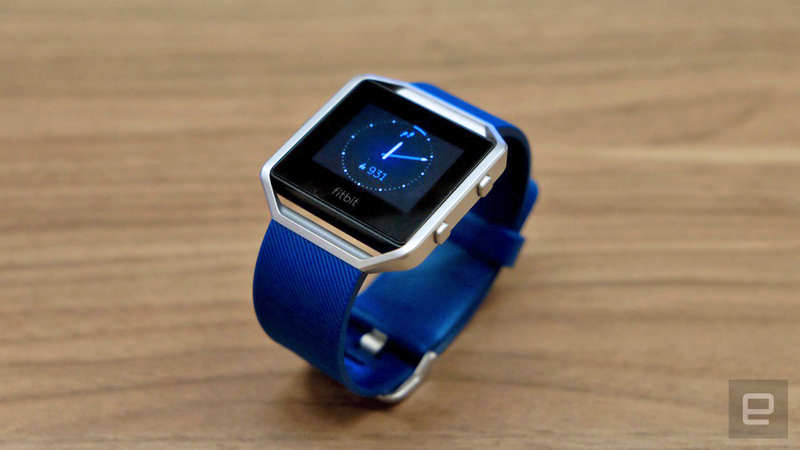 Fitbit promises five-day battery life, which is about how long my review unit lasted. If you're doing lengthy workouts every day, you'll probably burn through the battery faster, but even so, I did three in a five-day period and the battery held up just fine. As for actually wearing the Blaze, it's a lot more comfortable than I expected. Perhaps my nerves were shot when I first tried the device at CES, but I was initially unimpressed with it. Though the watch lacks the polish of a premium product, I didn't mind wearing it for extended periods of time. The Blaze is very light, which helps it recede into the background while you're wearing it. The elastomer strap is clearly the better choice for working out, but the rest of the time I preferred the leather option. Fitbit's silicone is good enough, but it's definitely not as comfortable as Apple's own sport bands. The leather option felt more comfortable to wear for extended periods, but neither band feels particularly well crafted. With the base $200 edition and elastomer strap you're getting what you pay for, but at $100 the leather strap isn't exactly cheap. For the money, I would have expected a higher-quality, more supple feel. That said, over the week or so I wore it, I did manage to break the strap in a bit, and it ultimately became my go-to band when I wasn't exercising. Ultimately, the whole package feels decent for the price, but it's not something I looked forward to wearing every day. It's just not fashionable, and it feels rather cheap. It lacks the retro futurism of the Moto 360 and the craftsmanship of the Apple Watch. Yes, it's less expensive than either of those devices, but for a wearable to be successful, people should actually want to wear it every day, and that just wasn't the case for me. I'd even be more inclined to wear Fitbit's new Alta tracker over the Blaze: It makes no bones about being just a fitness tracker, whereas the Blaze is in the awkward position of being a gadget that tries but fails to be stylish. It's hard to make a smartwatch that doesn't look like a tiny computer on your wrist, but the Blaze is even less successful in that regard than its rivals. 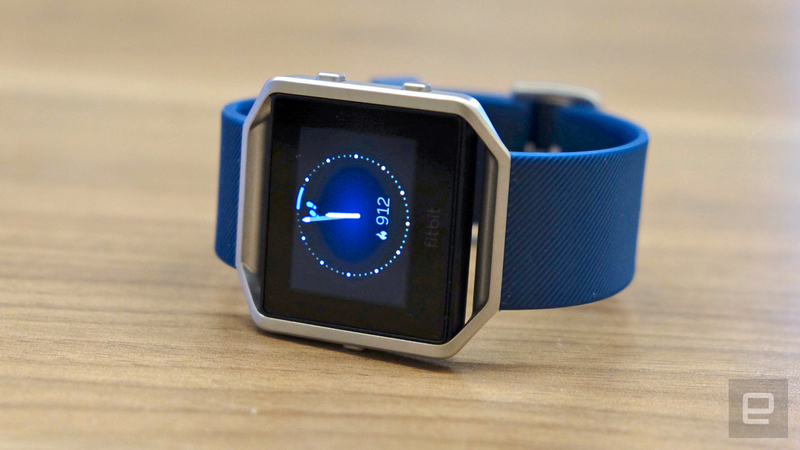 Most Fitbit devices have a bare-bones UI, the better to accommodate their tiny displays. That's not the case with the Blaze, which features a larger 1.25-inch color touchscreen with a 240x180 resolution. As such, there's a lot more you can do directly on the device compared with older Fitbits. The "home" screen here is a watch face; there are four to choose from in the Fitbit app. The default analog watch face crams in a surprising amount of info: Besides viewing the time and date, you can tap the screen to cycle through the steps and distance you've taken that day as well as view your heart rate, calories burned and stairs climbed. By default, a ring around the clock dial also shows you how close you are to getting in your recommended 10,000 steps a day. I liked the concept of this face, but ultimately it was a little hard to actually read as a watch, so I used another option called "Pop" that shows the time in bold numbers alongside little icons indicating how close I was to meeting my daily goals. Tapping the screen let me cycle through steps, heart rate and calories burned. From the watch face, you can swipe to the right to access the Blaze's other main "apps" (for lack of a better word): Today, Exercise, FitStar, Timer, Alarms and Settings. The last three are self-explanatory; we'll delve more into those first three now. While you can view all sorts of fitness data from the watch face, you're better off jumping into the "Today" view, which presents an easy-to-read summary of your progress, including steps, total distance, flights of stairs climbed, heart rate and calories burned. All of this data is available in the Fitbit smartphone app, but it's convenient to view it right on the watch itself. That said, it's strange that the "active minutes" measurement, which measures "moderate" activity done in periods of 10 minutes or more, isn't available on the watch. If you want to formally track a workout, the exercise app is where you do it. There you'll find options to record outdoor running, biking, treadmill, elliptical and weights, with a generic "workout" catch-all for everything else. It covers the basic set of activities that Fitbit expects users will want to track and that the Blaze can capture with some degree of accuracy, and it's similar to the feature set you'll find on competing products. People who are really serious about tracking their workouts will probably prefer more expensive and purpose-built tracking devices, like a triathlon watch or cycling computer, but for the Blaze's target audience, these preset workouts should be enough. Most of my exercise comes in the form of running, but the Blaze includes a feature called FitStar that includes three short cardio routines: an eight-minute warmup sequence, a seven-minute workout that puts you through 13 different exercises (pushups, jumping jacks, crunches, squats, etc.) and a 10-minute ab workout. It's a smart addition, and hopefully Fitbit will add even more programs. Fitbit did confirm the Blaze would get software updates over time, the first of which will add reminders to get up and move around. While I occasionally longed for the Apple Watch's various reminders and apps, there's something to be said for paring down. Besides, I've already turned off most notifications on my Apple Watch anyway. Rather than offer its users that option, Fitbit just decided to limit the notifications out of the box. 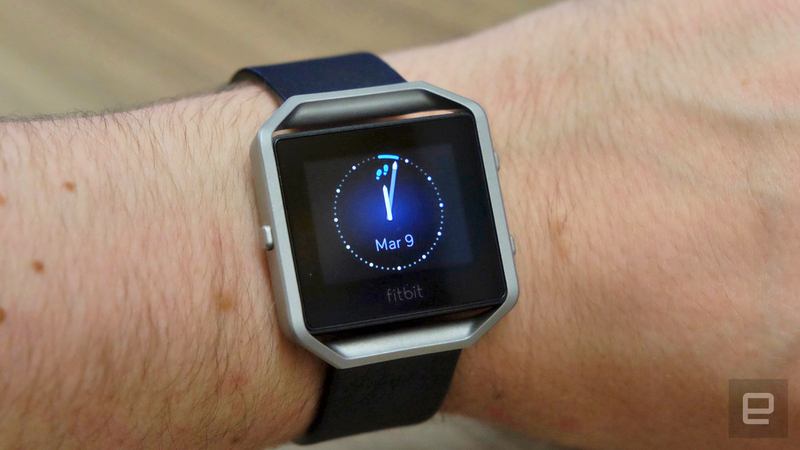 It's a logical approach, as Fitbit hasn't positioned the Blaze as a true smartwatch competitor. The Blaze's non-fitness features are limited, and that's probably a good thing: The device has a small screen, and trying to do more with it would probably make for a frustrating experience. What really matters for a device like this is what it's like to wear day to day. Even though the Blaze's design didn't bowl me over, it continues Fitbit's long tradition of offering solid activity tracking features that work well on their own, in the background. On days when I wasn't doing a full workout, the Blaze largely left me alone. I'd get the occasional notification for text messages, and I of course checked the time and my step count, but that was it. All told, the Blaze demands less attention than the Apple Watch, and there's definitely something to be said for having a smartwatch that isn't constantly begging to be used. That's a good thing, because the screen on the Blaze is rather small and unresponsive. I'm not sure if that's a hardware or software issue, but my taps to the screen didn't always register. The "raise your wrist to see the time" gesture was similarly hit-and-miss; I wish it was more sensitive by default. The Blaze becomes more useful when you work out on a regular basis. When I started an outdoor run, the Blaze hooked up to my phone to track and save my route, just as Runkeeper does. As you run, you can see the total distance, steps taken, current and average pace, and calories burned. As for the accuracy of its distance tracking, the GPS connection with my phone means it gave me near-identical results to what both Runkeeper and the Apple Watch reported. Still, there were some differences in the data the Apple Watch and Blaze reported. Though the Blaze typically showed a higher step count than the Apple Watch, it said I didn't travel as far. Similarly, when running on the treadmill, the Blaze reported significantly different number vs. the Apple Watch -- but it seemed to be more accurate, at least when compared to what the treadmill itself said I was doing. The Apple Watch typically says I run a lot faster than the treadmill (a nice ego boost) but the Blaze's readout was closer to the treadmill's, even though it says I'm slower. What's most important is a tracker being consistent, and the Blaze is. While the Blaze's exercise tracking features work well enough, there was one feature I missed from other apps like Runkeeper or the Apple Watch's built-in fitness app: I found it strange that you couldn't set goals for a particular workout -- say, run for 30 minutes or burn 300 calories. It's nice to get a sense of how far along you are in the middle of a workout, and while you can set a goal in your head, it makes it a little harder to see how close you are toward meeting it. Getting specific feedback from the watch during my workouts would have been helpful. That said, if you're the type of person who sometimes forgets to formally track a workout, the Blaze has you covered. The tracker can automatically recognize various activities and add them to your workout history. By default, it'll only add an activity when you keep it up for 15 minutes or more, but you can adjust that in the settings for when you do shorter workouts. In my tests, it worked like a charm. While the Blaze didn't recognize my four-minute warmup walk on the treadmill, once I started running, my heart rate went up and the Blaze proceeded to track my entire run. It was even smart enough not to terminate the workout when I took a short walking break. The downside is the auto workout feature doesn't track distance or use the GPS to record a route, so you don't get as much data as you would otherwise. The Blaze has a lot of competition, both inside and outside of Fitbit. The closest thing that Fitbit offers is the Surge, which has a nearly identical feature set. The Surge, which costs $50 more, offers built-in GPS for phone-free run tracking, while the Blaze instead brings a more watch-like design, interchangeable bands and those FitStar exercise routines. The $130 Fitbit Alta and $150 Fitbit Charge HR both also have displays (albeit tiny ones), but lack some key features the Blaze offers: The Alta doesn't have heart-rate tracking or music controls, for instance, while the Charge HR doesn't support music controls or incoming notifications. Comparable products from other brands include the Basis Peak ($150), Microsoft Band 2 ($175), Garmin Vivosmart HR ($150) and Polar A360 ($200), to name just a few. All of these devices have screens of some sort, and all will show you some subset of your phone's notifications. With the exception of the Polar A360, all are cheaper than the Fitbit Blaze, but again, the features vary, so choose carefully. Of course, the Apple Watch ($350-plus) and Android Wear devices like the Moto 360 Sport ($300) deserve mention as well. Fitness tracking is actually one of the best things about the Apple Watch, and it does a heck of a lot more than the Blaze. The Moto 360 Sport doesn't stack up as well against the Fitbit as an exercise tracker -- but again, Android Wear makes for a more versatile device overall. If you think of the Fitbit Blaze not as a smartwatch, but just the latest in a long line of fitness trackers, the device is fairly successful. It's $50 cheaper than the Surge but has nearly the same feature set. It also adds some important features like a color display, changeable bands and the most stylish design we've seen on a Fitbit product. It's definitely not as attractive as competing smartwatches, but it at least doesn't scream "fitness tracker" like the rest of Fitbit's lineup. The company also gave the Blaze a purposefully limited feature set, rather than trying to make a true Moto 360 or Apple Watch competitor. That might come as a disappointment to those who thought the Blaze would scratch the smartwatch itch at an affordable price, but if you're looking for a fitness tracker with a smartwatch-inspired design and a few nice extras, the Blaze is worth considering. It combines robust fitness tracking, excellent battery life and a few other tricks in a package that's more attractive than anything else Fitbit has ever put out. The big knock I have against the Blaze is that it still feels far more gadgety than I'd like for a device you prominently display on your wrist. Obviously, looks are subjective and some might fall in love with the Blaze's design. But it faces stiff competition from the likes of the Apple Watch and Moto 360. The Blaze works best if you wear it on your wrist every day, forsaking all other watches, smart or otherwise. Ultimately, that's not a commitment I'm willing to make.